Hey, everyone! 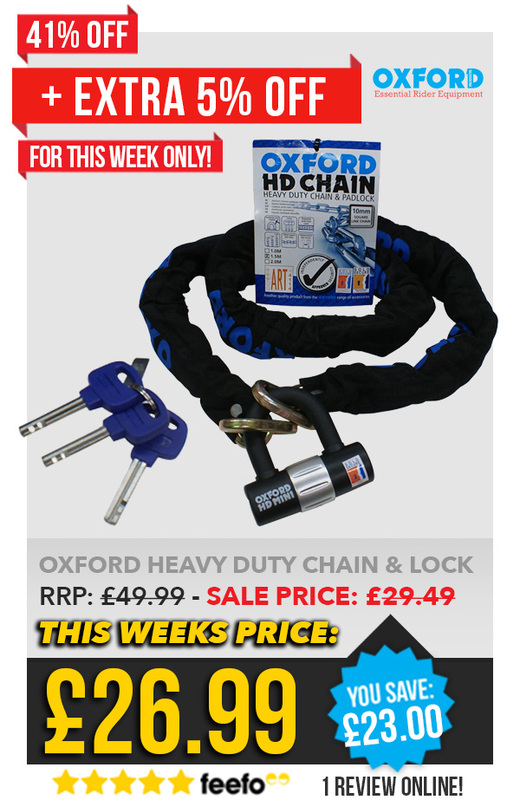 Keeping your pride and joy shouldn’t cost so much, so the Oxford Heavy Duty 1.5m Chain and Lock is on our list of offer for Deals Week! Treat yourself and secure your ride! Motorcycle theft has always been a problem and theft in general only seems to be on the rise the closer it gets to Christmas. So why not make it harder for anyone looking to pinch your bike or scooter. The idea is to make it so difficult that it no longer becomes worth it and increases your chances of noticing something is amiss. With 9.5mm hardened steel links there’s no way they they’ll be able to get through it quietly. The lock it’s self is also drill resistant, so no matter how a thief looks at the situation- however they choose to try and get through your Oxford HD Chain and Lock, it’s going to take time and make noise. But be sure to chain your ride to something solid and secure otherwise it won’t be as effective. A little peace of mind is well worth the £26.99 from our Deals Week offer on an item every biker should have!